Lebanon stands out for its beautiful nature and the multiplicity of tourist attractions, which include the cedar forests of Bcharee and Tannourine, the Qannoubine Valley , Jeita Grotto, Baalbek Castle, Tyre, Sidon and Jbeil. Small yet diverse, it markets itself as a country where you can ski on snow-capped mountains in the morning and swim in the Mediterranean Sea in the afternoon. The Lebanese Ministry of Tourism seeks to focus on all these distinct features to attract the largest possible number of tourists. What this focus carefully overlooks is the environmental pollution that is threatening Lebanon’s natural wealth and harming public health. Analysts believe that the main causes of the worsening pollution problem is the failure of the state and concerned authorities over the past years to find drastic solutions. The garbage crisis – the uncontrolled dumping of trash – which hit local and international headlines in 2015 played a key role in shedding light on the environmental issues that have become a prime concern of Lebanese citizens. The ‘You Stink’ campaign launched in response to the crisis, published on its Facebook page a video clip titled ‘Last Warning’. The video, which shows tons of household waste littering roads, river banks and shorelines, highlighted both the extent of the crisis and the government’s failure to resolve it. It is worth mentioning that this particular crisis dates back several years, the result of a lack of clear planning and sound procedures to dispose of waste (both solid and liquid) and garbage. There are two main ways of disposing of garbage and waste in Lebanon. The first is incineration, which results in the emission of toxic gases such as carbon monoxide, the inhalation of which blocks the transfer of oxygen to the brain and the heart, and in extreme cases can lead to death. Moreover, dioxin released by combustion can seriously affect the nerves and immune system and may cause a number of cancers, while sulphur dioxide may lead to acute asthma attacks. The second way is landfills, which are often scattered randomly throughout the country. 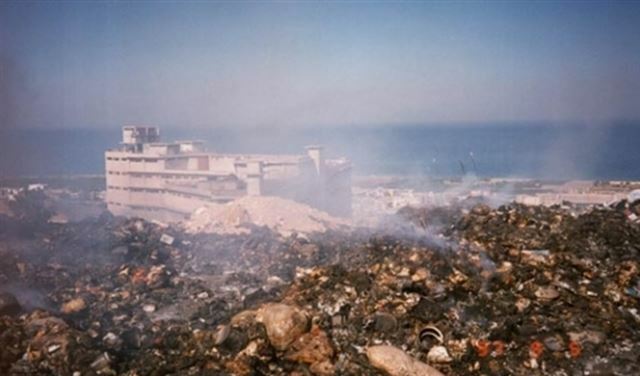 The most recent garbage crisis resulted from the closure of the al-Na’imah Landfill, the biggest in Lebanon, due to the serious health problems experienced by residents living in towns adjacent to the site. Landfills can also lead to the emission of toxic gases such as carbon dioxide, reducing oxygen levels in the air, and decomposing waste can enter surface and groundwater sources. In this context, Lebanon’s National Council for Scientific Research issued a statement declaring that ‘during the sandstorm that hit Lebanon and the region on 7 September 2015, which reached a climax on 9-10 September, a research unit sponsored by the council managed to measure air pollution levels in the city of Beirut compared to previous average rates’. The statement said that pollution increased exponentially such that it exceeded the average rates by nearly 120-fold in particles the diameters of which were not more than 10 micrometres, whereas air pollution in particles with a diameter of 2.5 micrometres per particle exceeded the average rates by six-fold . However, it is not possible to define the exact rates of air pollution in the past year or measure the exact amount of toxic gas emissions resulting solely from the accumulation of rubbish and waste, because pollution in Lebanon has many different causes. A major problem is the emission of toxic gases from factory chimneys and power generating plants. In 2014, Our Lady of Lebanon Hospital in Jounieh, east of Beirut, which is located close to the al-Zawq thermal power plant, recorded 1,300 cases of asthma attacks and 1,280 cases of acute respiratory infections, in addition to 84 cases of lung cancer. Some sources noted that the carbon dioxide released from the thermal power plants in the industrial area of Shakka in northern Lebanon is one of the main causes of lung cancer. Despite all the promises made to local municipalities and residents, environmental problems caused by chimneys have worsened year after year. Exhaust emissions exacerbate the problem because Lebanon in general, and Beirut in particular, is home to a high number of vehicles. Unofficial figures show that there are about 5 million registered vehicles, both public and private, in an area of 10,452m2, a figure that is considerably higher than it could be if a strong public transportation system were in place. The pollution of Lebanon’s coastline and water sources as a result of unregulated factory discharge constitutes another major problem. Thousands of industrial waste and pollutants are released into the sea every year, carrying with them large amounts of chemicals that directly harm marine life. Raw or insufficiently treated hospital and household sewage also carries with it organic materials that pollute the sea. Oil leaks from the thermal power plants south of Beirut, the result of the Israeli attacks on Lebanon in 2006, has worsened the situation. Rapid population growth, including the arrival of around 1.5 million Syrian refugees, is further depleting resources and stretching Lebanon’s capacities to breaking point. In 2014, Environment Minister Mohammad al-Mashnuq issued a statement evaluating the impact of the Syrian refugee crisis on the environment based on a study carried out by the Lebanese Ministry of Environment. Preliminary results indicated that Syrian refugees produce approximately 15 per cent of the solid waste that the Lebanese population used to produce ahead of the refugee crisis. The study also showed that wastewater ratios rose to about 14 per cent and that this increase may lead to the blockage or overflow of the sewage system. As for air pollution, the same study showed an increase in the emission of air pollutants to 20 per cent as a result of significant traffic increases in the cities hosting large numbers of refugees. Based on the above, experts in actuarial science and the heads of environmental associations believe that finding quick and drastic solutions to Lebanon’s environmental pollution problems are likely to be extremely difficult in light of the country’s worsening security and economic situation. At the same time, these associations propose solutions that may have a positive impact on the Lebanese environment.